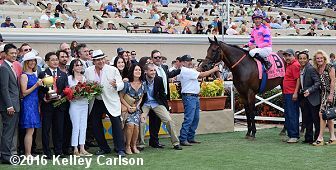 The highlight race of the Del Mar meeting is the $1 million TVG Pacific Classic (G1), featuring the best older horses of the west coast going 1 1/4 miles over the dirt, and is a Breeders' Cup Challenge "Win and You're In" qualifier for the Classic. 24,155 fans packed the seaside oval on Saturday afternoon under cloudy skies and temperatures in the high 60's. 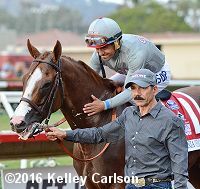 As expected, California Chrome was sent off as the 11-10 favorite in the field of 10 off wins in the Dubai World Cup (G1) and San Diego Handicap (G2). 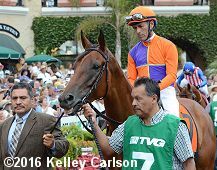 In to challenge him included 5-2 second choice Dortmund, second in the San Diego Handicap after winning the Native Diver (G3), and 3-1 third choice Beholder, last year's winner but second in the Clement Hirsch (G1) after winning the Vanity Mile (G1). 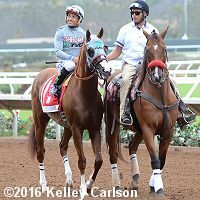 Jockey Victor Espinoza sent California Chrome to a clear lead first time past the stands and he set fractions of 23.20, 47.29, 1:11.22, and 1:35.69 over the fast track while pressed by Beholder and stalked by Dortmund. At the top of the lane California Chrome began to pull away from Beholder, opening up by 4 lengths at the 1/8 pole and finishing up under wraps 5 lengths clear, stopping the timer in 2:00.13. It was another 2 1/4 lengths back to Dortmund third. 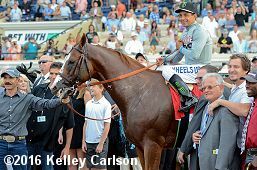 Left: California Chrome in the winner's circle. 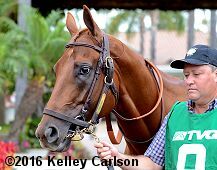 Winning trainer Art Sherman said, "I saw the hold Victor had on him and he was just cruising I thought 'It's all over.' (Beholder) was driving to catch him and I knew that if Victor had to get after him he was just going to rebreak and pull away. What can you say about him he's just a super horse. That's why he's the best horse in the country. The mare run a hell of a race, she's a nice mare. But I looked at the field she run against last year and I said, �She's hooked up a different horse. So I felt pretty confident." Right: California Chrome in the post parade. Winning jockey Victor Espinoza, celebrating his first Pacific Classic in his 17th try, said, "When I was behind the gate I thought I'm going to send hard out of the gate and then move out just a little toward the middle of the track. I tapped California Chrome a couple of times and I was surprised I opened up two or three lengths right away. By that time I was very confident and happy. That's where I won. The fractions weren't that slow, the pace was pretty good. I don't worry about any other horse. 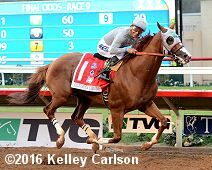 I just worry about California Chrome and as long as he's comfortable and happy he's going to win the race." Left: Second place finisher Beholder in the paddock before the race. 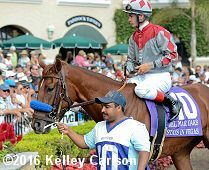 Jockey Gary Stevens said, "She ran a great race. I was hoping that she'd have that huge kick again like she did last year, but not this time. But it was a gutty performance for her. But Victor was playing with us. I don't think he really let him run. That's scary to think about. 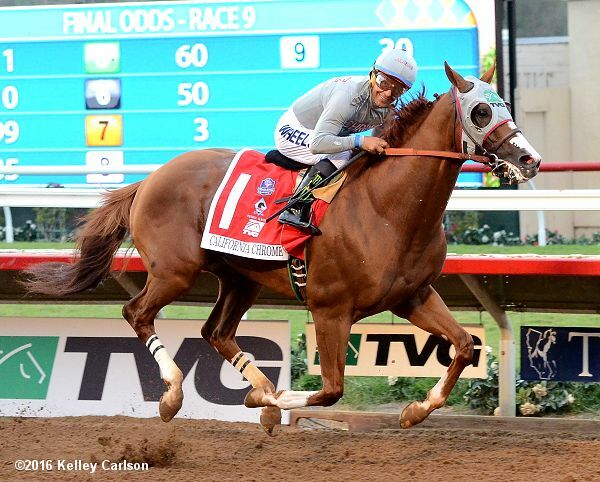 Hats off to California Chrome." 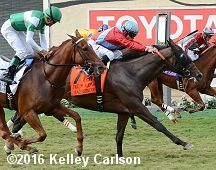 Trainer Richard Mandella added, "She ran really good; just second best. I went over and told Art that he did a fabulous job with his horse. He's always been a great horsemen, I'm just sorry it was at my expense." Right: Third place finisher Dortmund in the paddock. Jockey Rafael Bejarano said, "He tried. He just wasn't there today. Maybe that distance is a bit far for him." Jimmy Barnes, assistant to trainer Bob Baffert added, "Victor took it right to us right from the start. They just went around 1-2-3 all the way." 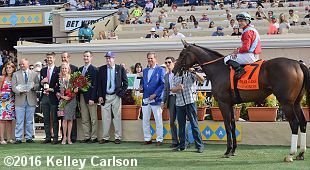 Immediately before the Pacific Classic was the $250,000 Del Mar Handicap (G2) for older horses going 1 3/8 miles on the turf, and is a "Win and You're In" qualifier for the Breeders' Cup Turf. Last year's runner-up Ashleyluvssugar was sent off as the 5-2 favorite in the field of 12 off a close second in the Eddie Read (G2). 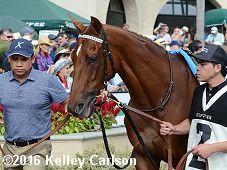 In to challenge him included 7-2 second choice Flamboyant, third in the Eddie Read (G2) after finishing 5th in the Dubai Turf (G1), and 4-1 third choice Metaboss off an allowance win. 57-1 El Huerfano led the field around the first of 3 turns through an opening quarter of 25.27 before Ashleyluvssugar took over first time past the stands. Loose on the lead he set easy fractions of 49.62, 1:14.58, and 1:39.49 over the firm going, with El Huerfano giving chase. Entering the stretch, Ashleyluvssugar still had a 2 length lead through 1 1/4 miles in 2:03.87. Metaboss, well back early, rallied down the center of the course but Ashleyluvssugar held on to win by a nose in 2:16.11. It was a length back to 42-1 Texas Ryano third. Left: Ashleyluvssugar in the winner's circle. 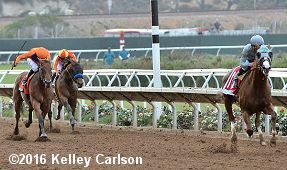 Winning trainer Peter Eurton said, "That was so close. The other horse was so far from ours to the outside that I really couldn't tell if we'd won or not. Gary (Stevens) just rode an amazing race. God that was great. That was a Hall of Fame ride. I didn't tell him anything (strategy wise); that was all Gary." Right: Ashleyluvssugar returns after the race. Winning jockey Gary Stevens said, "He was waiting on horses. I tried to stay busy on him, but he was waiting. (The other riders) know it and know him. They came at him out in the middle of the track. He never saw them. I knew we were going slow and I knew I saved all (the ground) I could. There were some photographers near the 7/8 and he propped from them. Wish they wouldn't let them be there." This was the first Del Mar Handicap win for both jockey and trainer. 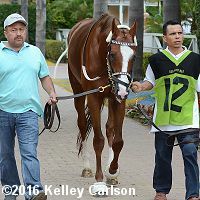 Left: Second place finisher Metaboss in the paddock before the race. Jockey Rafael Bejarano said, "I hate to get beat like that. Hate it. My horse was flying. I thought sure I'd won." Right: Third place finisher Texas Ryano heads into the paddock. Jockey Joe Talamo said, "Great trip. Sitting in the right spot. He fired. Can't ask for more than that." 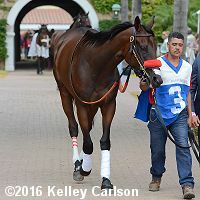 Kicking off the stakes trio on Pacific Classic day was the $300,000 Del Mar Oaks (G1) for 3-year-old fillies going 1 1/8 miles on the turf. San Clemente Handicap (G2) winner Mokat was sent off as the 3-1 favorite in the field of 10. 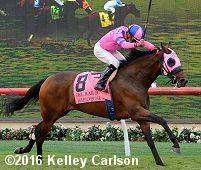 In to challenge her included 7-2 second choice Harmonize, 5th in the Belmont Oaks (G1), and 4-1 third choice Barleysugar, winner of the Sandy Blue Handicap. Jockey Rafael Bejarano sent 13-1 Lady Valeur to the lead first time by through fractions of 23.43, 47.87, and 1:12.69 while pressed by 6-1 Stays in Vegas and stalked by Mokat. Entering the lane, Stays in Vegas passed the tiring pacesetter to gain a 1 1/2 length lead through 1 mile in 1:36.88, but Harmonize, 7th early and 3 wide, rallied and outfinished 9-1 Decked Out, last early, to win by a head in 1:48.71 over the firm going. It was a nose back to Stays in Vegas third, and 1/2 a length back to favorite Mokat fourth. Left: Harmonize in the winner's circle. Rodolphe Brisset, assistant to winning trainer Bill Mott said, "We already faced the very nice fillies on the East Coast, Catch a Glimpse and Time and Motion, and we thought coming here would be a good opportunity to win a Grade I. We got a dream trip and got there at the wire, so that's very good. We're going back to New York on Wednesday, but now .we'll just enjoy this one." Right: Harmonize returns after the race. Winning jockey Junior Alvarado said, "She had some trouble last time, but she ran just right today. Bill (trainer Bill Mott) didn't give me any special instructions before I came out (from Saratoga). He rarely does. But she was full of run today and showed everyone just how good she is. This is my first mount at Del Mar. Amazing. I win a Grade I. It doesn't get any better than that. I've wanted to ride here and now I have and it worked out great." Left: Second place finisher Decked Out in the paddock before the race. 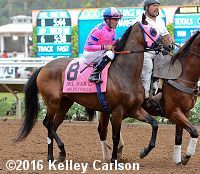 Jockey Kent Desormeaux said, "She ran great. She went 22 and change down the lane, again. The winner was incredible. She had to be to beat my filly today." Right: Third place finisher Stays in Vegas in the paddock. 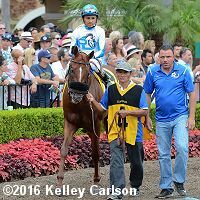 Jockey Flavien Prat said, "I had the good trip. The post wasn't the best for her, but what are you going to do. She ran well. I thought I had it." Fourth place finisher and beaten favorite Mokat heads into the paddock before the race. 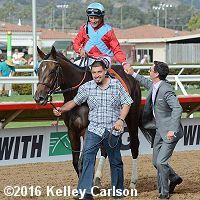 The Richard Baltas trainee has a record of 2 wins, 2 seconds, and 2 thirds in 10 starts, earning $303,00 for owner J K Racing Stable.